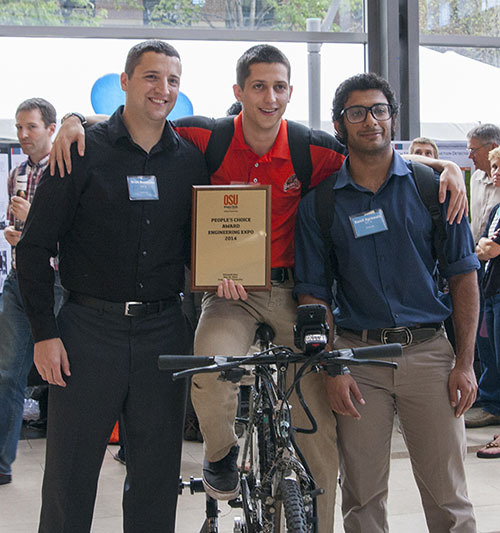 Brian Benavidez, Arron Bellini, and Kamil Agrawala win the People’s Choice Award at Oregon State’s Engineering Expo. The whirring sound of bike tires spinning on stationary stand could be heard throughout the Kelley Engineering Center as one after another Engineering Expo visitors tested out the Intellicycle. Based on the number of people flocking to get on the bike it was not surprising the senior design project won the People’s Choice Award. But it was more than senior Arron Bellini had anticipated. “I wasn’t expecting more than passing glances, but then the interest in it blew up. It was pretty crazy,” Bellini said. The Intellicycle is a device that can be added to any bike to measure speed, distance, cadence and temperature. The information is sent to a smartphone where it is displayed on a mobile application which can also bring up a map of your location. There are no worries about the phone running out of battery life, because the system harvests energy from the front wheel. In addition to recharging a phone, the power system runs the lights on the bike. But they are not just ordinary lights — these “smart” lights automatically turn on when it gets dark, and can also be controlled manually. Brian Benavidez said he thought their project did well at Expo because it was very hands-on, it was easy for people to understand and useful to many types of bike riders. Having a bike situated in the atrium of Kelley was an amazing hook to get people interested. “We had a five-year-old riding it and an 82-year-old riding it, and they both had huge smiles on their faces,” he said. Beyond seeing how fast they could get the bike to go, the visitors also had questions. Benny Beaver tries out the Intellicycle. “We had genuine questions from people who are not engineers wanting to know how it works. It was cool that we could take some complicated engineering and convert it into something that a 5-year-old kid wants to know about. It turned the competition into education,” Kamil Agrawala said. The project, which was first hatched by the friends at a football game, split nicely into three parts they each had independent control over: the power system, the sensors, and the mobile application. The hard part, they all admitted, was getting the three separate parts to work together. And although they sometimes butted heads on how to get it to work, they left business behind them when they would hang out together as friends. “The one thing I would tell other students doing their senior project, is pick a team that you have a good group chemistry with, because you’ll be working with these people for a year,” Agrawala said. The many hours of work paid off in a project that captured the imaginations of those who visited, some who wondered if the group would turn it into a marketable product. For now, the success of finishing is enough. “To come up with a plan and execute it the way we wanted to, and then to cap off with the award was a pretty monumental achievement. Right now I’m just feeling sincere gratification,” Bellini said. Oregon State students Chris Vanderschuere, Carly Farr, and Bret Lorimore teamed up to create an app for the Corvallis Transit System to help bus riders track when their bus will arrive. Now available on iTunes, the app won the presentation award at OSU’s App Challenge on May 10. It was featured in The Daily Barometer and KEZI. After participating in the App Hackathon last year, Nicole Phelps knew she wanted to bring the experience of creating an app to more students. 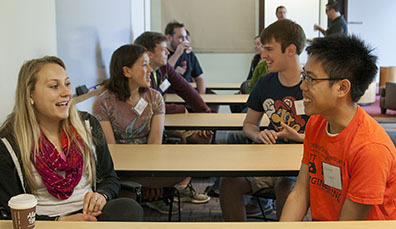 Renamed OSU’s App Challenge, she David Meehan organized the event this year that culminated in a competition on May 10. It was the capstone senior project for the two computer science students. Phelps and Meehan taught weekly classes in Android and iOS development to prepare students for the competition. But expanding students’ skills was not the only point to the competition. 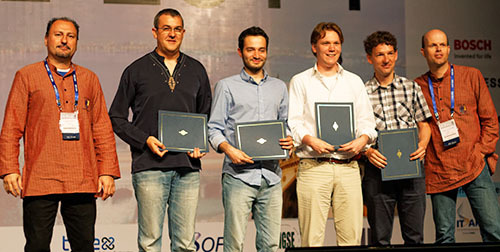 OSU’s App Challenge organizers pose with the judges. 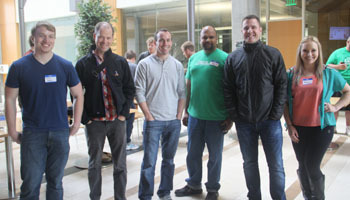 (left to right) David Meehan, Luke Kanies (Puppet Labs), Bryce Clemmer (Vadio), Shashi Jain (MatterCompilers), Scott Kveton (Urban Airship), and Nicole Phelps. “The event currently has some amazing judges, which provides students with an uncommon opportunity to network with inspiring role models in the tech industry,” Phelps said. The judges this year were Scott Kveton, CEO and co-founder of Urban Airship, and co-founder of OSU’s Open Source Lab; Bryce Clemmer, CEO and co-founder of Vadio; Luke Kanies, CEO and co-founder of Puppet Labs; and Shashi Jain, CTO and co-founder of MatterCompilers and Corporate Innovations Lead at UP Global. Encouraging teamwork was the focus of this year’s event which Phelps said is an important skill for future jobs, but also makes the experience more fun and less pressure. Luke Kanies, of Puppet Labs, said he could see a significant improvement in the quality of the apps this year and was impressed with partnerships that the students had with industry and research labs. “The organization has learned a lot over the year,” he said. 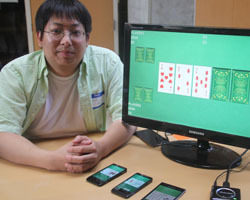 Francis Vo shows off his app to play Texas hold ’em. Several app developers had real clients: Three of the apps were built for the Corvallis Transportation System to help bus riders navigate the bus system, Francis Vo and Meghan Gorman competed with an app sponsored by Intel that displays a game from multiple phones on one TV screen, and the overall winning team, OccuChrome, developed an app for an Oregon State chemistry lab to read enzyme slides using a smartphone camera, and analyze the chemical reaction. Others brought apps that they developed for their own use. Greg Luis-Ramirez competed with a quiz app that he uses as a study tool, and Michael Woffendin and Nick Piatt created an app that uses ratings that friends give restaurants to find one that everyone will agree on. “I have very indecisive friends,” Piatt said with a smile. Thanks to a generous donation by Urban Airship, and swag by Google, the participants also received some great prizes. The overall winner received a $200 Amazon gift certificate and all other winners received $75 Amazon gift certificates. 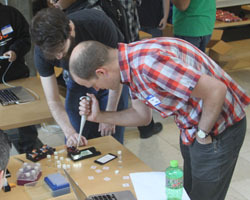 Joe Runde helps Luke Kanies test out the OccuChrome app that reads and analyzes enzyme slides. OccuChrome automates the process of calibrating statistical models to evaluate reactions on enzyme slides. This will speed up research processes in a lab setting, and may have further uses in the field as a mobile diagnostic platform for doctors. Corbus is an app that is meant to assist users of the Corvallis Transportation System. The goal of the app is to provide a quick and beautiful interface that can help users easily plan and navigate the buses of Corvallis. 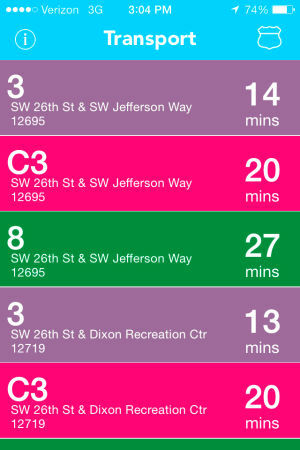 Transport app for the Corvallis Transit System, which serves to provide bus riders with real-time information about where the bus is and when it will get to your stop. LANREG is an event registration web application that is designed to support small to large scale LAN parties. It includes organization, event, and seating chart creation tools along with full PayPal payment integration. Profit is a simple mobile app that solves the three biggest problems freelancers and small business owners face: taxes, audit preparation and client tracking. 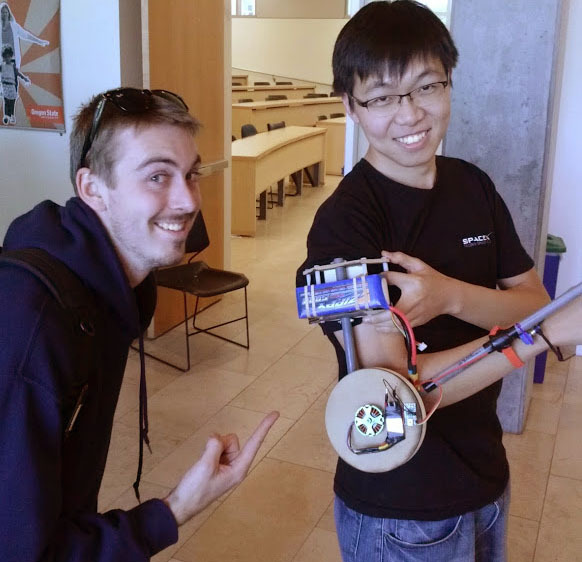 Of the over 500 teams that applied, two Oregon State teams were among the top 35 to make it to the finals of Intel’s 2014 Cornell Cup competition, held on May 2 and 3 at Walt Disney World in Orlando, Florida. After three rounds of judging by Intel representatives including a floor presentation, and a formal pitch to an audience — both teams were awarded honorable mention. The competition gives students the real-world experience of working as a team to design a product for a client. “There will be supply chain issues, there will be hobgoblins in what should be working hardware, there will be times when you absolutely lose the motivation to fix the last few issues. How you overcome these challenges dictates what kind of engineer you are,” said Kevin McGrath, advisor to the teams. 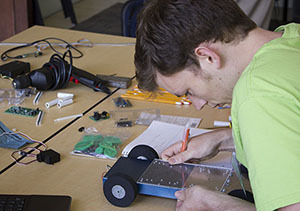 The two teams were multidisciplinary including members from computer science, and electrical and computer engineering. The Motion Safe Systems team also included a business major to help with marketing. A team of six took on the radical idea of turning cars into an alert system to contact emergency responders and warn nearby drivers when an accident occurs. 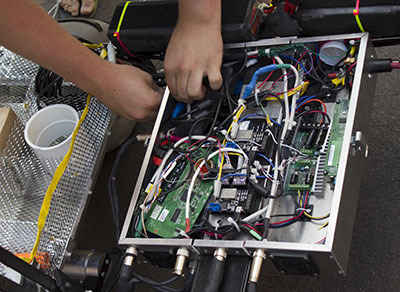 They created an affordable device that can plug into the on-board diagnostics port of a car. The device can detect a crash with a combination of instruments including an accelerometer, gyroscope, and magnetometer. But he genius of the system is it how the devices connect to one another via a wireless mesh network — allowing cars to “talk” to each other. Since no centralized controller is needed, the messages can be passed from car to car, spreading the information to cars too distant from the initial accident to receive direct transmission. Motion Safe Systems could also be expanded to allow users to connect with their smartphones to access other information from their cars such as fuel economy. The four members of the Dr. Wattson team designed a product to help inform consumers about their power consumption. Their device takes energy monitoring in the home to a new level by allowing consumers to monitor several outlets at once. The data is sent wirelessly to a base station, where it is entered into a database. A web interface pulls the data from the database and displays it in a way that makes it easy for consumers to understand, and is accessible by a computer, tablet or phone. This advances current technology, such as the Kill-A-Watt, which monitors just one outlet and requires the user to look at the actual device where it is plugged in — sometimes under a desk or behind furniture. 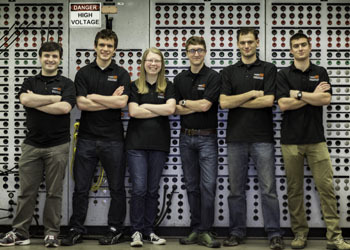 The team was also featured on the School of Electrical Engineering and Computer Science website. The competition allowed the teams to connect with engineering students from all over the nation and find out about their projects. “The Cornell Cup was a lot of hard work and a lot of fun. All 35 of the teams that were there definitely deserved to be there — great projects and smart people,” said Bennett Rand, computer science student. 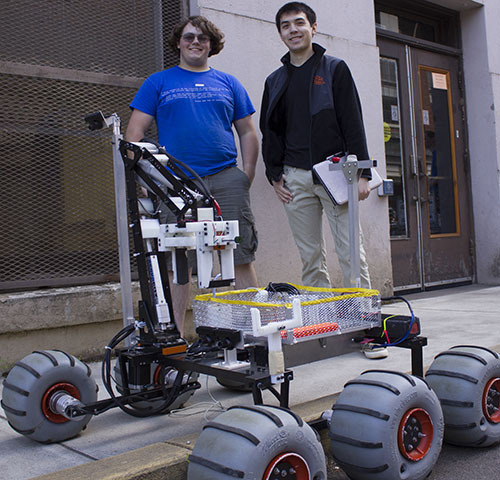 Both teams will have their projects on display at OSU’s Engineering Expo on May 16. Students interested in participating in the 2015 Cornell Cup can contact Kevin McGrath. 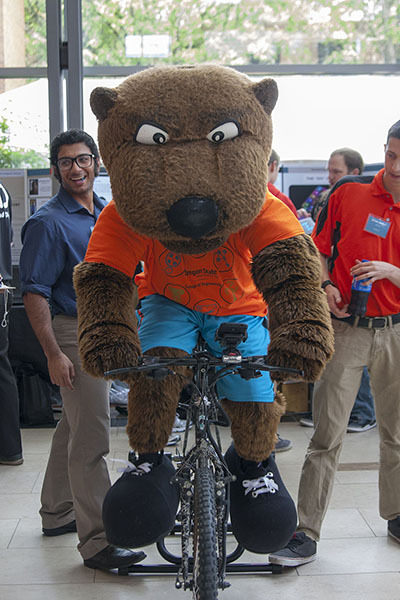 The OSU App Challenge will take place Saturday, May 10th 2pm-4pm in the Kelley Engineering Center Main Atrium. Each team will have a dedicated table to show off the App they created. Technology industry executives will tour the tables and judge each on Innovation, Completeness and Presentation. The OSU App Challenge is a competition empowered by OSU students who are eager to learn to make mobile applications. We are in the process of building a community at OSU around the app development process. All levels of experience (including no experience) are encouraged to attend. You can form a team or work individually.